Home » Uncategorized » YOU JUST CAN’T GO AROUND SPELLING NAMES ALL WILLY-NILLY! Every American woman wishes her closet was filled with designer clothes and accessories, and every American man would be beside himself to have one of those luxury cars parked in his garage. This love affair, specifically with the French, that we inherited from the English dates back to the 16th century. It was quite fashionable for the wealthy English to take trips to France and arrange French lessons for their children. When you consider the history together with the fact that―let’s face it, English is a bit lackluster. It is not surprising to see so many people attempting to give their children and businesses exotic and interesting, French-sounding names. The problem: not everyone understands or cares to understand orthography (a way in which the words of a language is spelled). As a result, names are created with ridiculous spellings where apostrophes and accent marks are haphazardly thrown about. Please understand. Just because you put an “o” at the end of a word does not make it Spanish, and just because you put an apostrophe in a name does not make it French. Apostrophes are utilized to indicate possession (John’s car), and plurals (The Evans’ house). In English, as well as in other languages, they can also be used to indicate the omission of (a) letter(s) (do + not= don’t, Je + suis= J’suis). The use of apostrophes in names is practiced by speakers of various languages. These constructions have survived from times long ago, when surnames were often derived from one’s place of origin (de Iberville= D’Iberville, which means from Iberville) or parentage (di Angelo= D’Angleo, Of Neal = O’Neal, which means son of Angelo and son of Neal). Accent marks are not used in English, but they are in other languages for the purposes of stressing pronunciation of vowels or to differentiate one word from another. 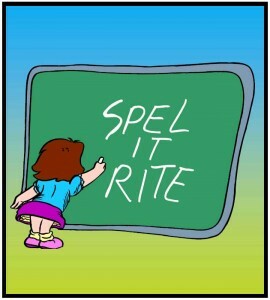 Many times I have watched elementary students try their very best to learn combination sounds and spelling rules only to be frustrated because the spelling of their own name does not follow the orthography rules they are being taught in school. If a student has an actual foreign name, they generally have no problem accepting the explanation that their name is from another language and therefore the rules for spelling are different. However, when someone’s name is clearly an independent creation, I am always at a loss for an explanation as to why the pronunciation of their name is spelled the way that it is. In an effort not to offend anyone―including a few of my own relatives, I am not going to give real examples of the sort of names to which I am referring. However, as I get off of my soapbox, I would like to leave you with a bit of advice and a heartfelt request. Naming a child is a very important job; it is a decision that should not be made quickly. One must think about how this name will carry him/her through life, in all of its various stages. If you are so inclined to bestow upon your child a name of your own creation, make sure you follow orthography rules for the language you are trying to emulate. By translationsbyrachel in Uncategorized on May 6, 2014 .